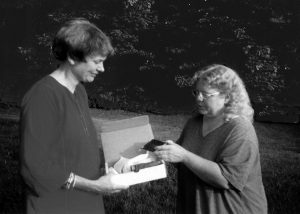 Joan Shack of Sri Sarada Society (left), accepting the gift of ten glass slides from Rosanne Buzzell during a visit to Green Acre, July 1999. In 1999 Sri Sarada Society was gifted ten of these glass “lantern” slides, thanks to Rosanne (Buzzell) Adams, archivist for the Eliot Baha’i Community and historian for Green Acre, in Eliot, Maine. The slides preserve photographed images of familiar figures in Vedanta’s early history in America. Featured are: Swami Vivekananda, Sarah Bull and her daughter Sara Olea, Josephine MacLeod, and Betty Leggett. The lantern slides likely come from the extensive collection of Ralph Sylvester Bartlett, a relative of Sarah Farmer who became a close friend to Olea Bull, Since first reporting receiving this gift in the Fall 1999 issue, we have learned that Bartlett was an avid collector of thousands of historical photographs. Wishing to preserve the images, he would take a photograph of the original print that he would have made into lantern slides. Bartlett is said to have meticulously labeled and catalogued each slide, storing them in mahogany cabinets. This explains how the Bull Villa images are said to have been taken in the 1870s. 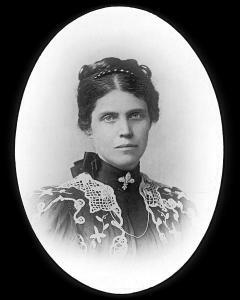 Bartlett, born in 1868, would have been under ten at the time. Some of the slides may have been taken by Bartlett himself, such as the ones taken in Norway of Olea Bull with Betty Leggett and Josephine MacLeod. In 2003 Sri Sarada Society received a request for scans of the two slides of Swamiji. This request, coming from Pravrajika Virajaprana of the Vedanta Society of Northern California, San Francisco, prompted us to have all ten slides professionally scanned. This digital format helps to preserve the pictures as well as to enhance the images using digital editing techniques. Thus, in preparing the scans for reproduction in a book being published in India, the nuns in San Francisco were also able to enhance the very worn images of Swamiji. The two photographs of Swami Vivekananda were long thought to have been taken in Kashmir and at Green Acre, respectively. Historical data, together with Bartlett’s own records, confirm that both were actually taken in October 1899 on the Ridgely estate, now known as Vivekananda Retreat Ridgely. Having the glass slides scanned also made them easier to share with others. We included six of the images in 2003 and 2005 print issues of Sri Sarada Society Notes. Now, eighteen years since receiving them, we are pleased to be able to share the all ten images here on the Sri Sarada Society Notes Online website. Click any image in the album below to open it in full view. Scans of ten glass slides of photographs showcasing familiar figures connected with Swami Vivekananda. A gift to Sri Sarada Society in 1999, the slides are likely from the extensive historical photograph collection of Ralph Sylvester Bartlett. The photos of Olea Bull and friends may have been taken by Bartlett himself. Everyone can break down something, but how many can build it up?